VOTING CLOSES MONDAY 29 MAY SO DO NOT DELAY! Bude Sea Pool’s application for a £5000 grant from Calor to purchase water pool fun equipment including floating water play mats, water slides, kayaks and canoes, large zorb balls, and other health and safety approved water play equipment has been shortlisted! We are up against lots of worthwhile projects, the projects which receive the most votes on Calor’s website will be shortlisted & reviewed by a panel of judges, they will then select the winning projects to receive funding. Please get behind us and please vote to make the Bude Sea Pool experience more fun for everyone! On Sunday 18th June come and join us for The Big Lunch from 2pm. Eden Projects Big Lunch is a community event that FoBSP are fully supporting in this our 4th! Since it began in 2009, The Big Lunch — the UK’s annual get together for neighbours — has grown ten-fold and each year gets bigger and better. Bring a picnic, or enjoy local food from Life’s a Beach. Music and entertainment, taster sessions in the water – Water Polo, BSLSC, Bude Canoe Club. Tickets for this year’s Bude Sea Pool Channel Challenge are now available via Eventbrite. Swim the distance of the English Channel in the safety of our spectacular sea pool. This is a team swim (minimum team size two swimmers, max team size 22 swimmers) Saturday 30 September. All money from entry fees goes towards the upkeep of this lovely sea pool. 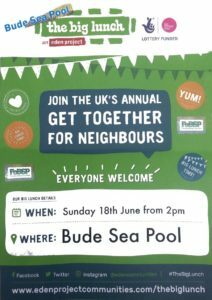 fund-raiser for The Friends of Bude Seapool. The gig raised over £1200 for the funds. Friends of Bude Sea Pool would like to express their thanks to the Falcon, to the fans & to the Friends who came along to enjoy the 2 hour show!